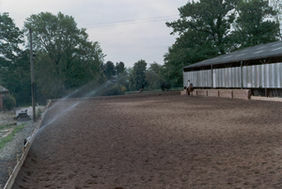 The advantage of a pump-operated system is that the arena can be watered in one or two sessions, operating half or all sprinklers each time. If your circumstances are such that a quick dampening of the arena is required between riding periods then this is, in our opinion, the most suitable system for you. The system operated off the mains water will operate one or two sprinklers at any one time, and watering time will be as long as is required to complete the whole cycle. This system is operated by an electronic timer that operates the sprinklers in sequence. This system is most beneficial for those that do not require the school to be dampened in quick short periods (the timer may be programmed to operate the system any time including nights). With either system we are able to use a wide range of nozzles which gives us the flexibility to design a system most suitable for you. For arenas up to a width of 25m and length of 60m, our standard system will be the most effective. In this system the pump can efficiently operate up to 5 sprinklers at a time. If your arena is wider than 25m then larger sprinklers, which operate individually, will be required. For this type of system an electronic timer is included to operate the sprinklers in sequence. Our largest system to date (using rain guns) is for a 150m by 55m outdoor arena. Our system uses modern pop-up sprinklers that are situated around the perimeter of the arena. The sprinklers are operated in groups according to the pressure available from one control area. Computerised or manual options are available. Through correct calculations of water pressure and flow, and with our knowledge of the appropriate kit, we are able to fit a system whilst keeping prices as low as possible. Economy systems, fully automated systems and individual sprinklers are available. Prices on application, according to requirements. The watering system for outdoor arenas consists of a number of sprinklers situated around the perimeter of the arena. For safety reasons we install pop up sprinklers where possible. These sprinklers retract into a plastic case when not in use.